2013 Bugatti Veyron 16.4 Grand Sport Vitesse can really growl on the road and can absolutely dominate a track at the high speed. The mighty Bugatti makes lots of noise and will growl in response as you punch the gas pedal. This is the world’s most extreme road car and will get you to 60 within the fastest time. Cross the 200-mph barrier effortlessly in 2013 Bugatti. Well, may be it is too fast for this world and most of us won’t have the courage to blast around in this land-bound rocket. This is the third and special edition that was developed for the 2013 Geneva Motor Show Motor Show. The chief competitors of 2013 Bugatti Veyron are Lamborghini Aventador LP700-4, Koenigsegg Agera R and the Pagani Huayra. Let us take a look at a comprehensive review on 2013 Bugatti Veyron 16.4 Grand Sport Vitesse. For the first time you will find the use of special color composition -Ying & Yang on the Grand Sport Vitesse. The car’s rear, the roof frame and the A-pillars get Bronze-colored carbon. The brown Fire Finch is used for the exterior mirrors and rear air intake grilles while the brake calipers and ventilation grilles are neutral black. Those enlarged air intakes, lower air slit and double diffuser make it easily distinguishable. The twin tailpipe is positioned centrally. The grille is in polished aluminum. A look inside and you will love the grouping of brown and Beluga Black and Gaucho leather. The center tunnel, three-spoke wheel and cockpit feature blue stitching, Carbon insertions are used on the iPad stowage, console extension, and on a cover that carries the EB logo. The curb weight is at round 4,387 pounds. The new Sport Vitesse boasts of an extra 200 hp with attendant drivetrain refinements. It gets power from a 7.9-liter, 1,200 hp engine and four turbochargers. Delivering an amazing power, it has been over engineered to the extreme. With a quartet of turbochargers and 16 cylinders, the Bugatti can perform beyond your expectations. It is no wonder that it is referred to as the culmination of engineers. With torque rising from 922 lb-ft to 1106 lb-ft, and 1,001 horsepower, one can comfortably get 210 and 212 miles per hour. Bugatti can reach a 0-60 mph in just2.6 second. It offers a fuel economy of 11 city and 14 mpg highway. 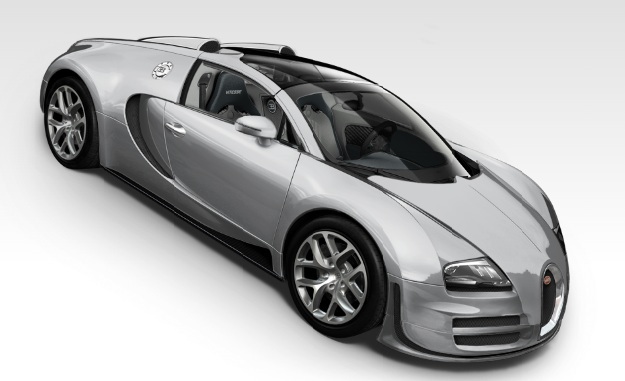 2013 Bugatti Veyron ranks high on safety features. The 4-wheel disc Brakes and independent Front and Rear Suspension, air bags are standard. There are special safety precautions at top speeds such as optimized wheel-load fluctuations and reduced understeer. . The outer skin is made from carbon fiber that offers very high torsional rigidity. Other safety features include restraint systems, knee pads, parking lock button and the illuminated start. 2013 Bugatti Veyron 16.4 Grand Sport Vitesse gives the impression of leaning more on the mantra of the hot-rodder’s and that is the more power the better. Besides being the most powerful roadster, it is also the fastest as well. With a price of about $2.5 million, what you get is 10 radiators, four turbochargers and the top speed of 255 mph. It is the fastest as well as the most expensive automobile ever. This is an engineering achievement and a tribute to the progressive automotive technology. With an extraordinary beauty and a brutal acceleration, the car will tame you with its docile manners and soft handling at slower speeds. Bugatti plans to make only around 100 of these models.